c.1980 | age 12 It’s the famous Star Wars Opening Crawl of text—and an autograph by Steve Sansweet (Ex-LucasFilm) from when I met him in April 2011. Would you look at the state of that inside cover? 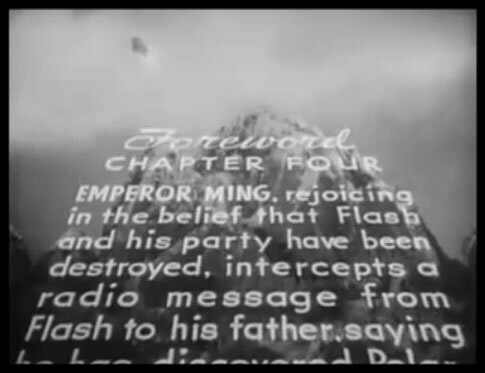 So I’ll talk about the Flash Gordon/Star Wars connection; meeting Steve; and my (then) 4 year old son groaning during the interminable crawl. The famous ‘crawl’ – depicted here, doesn’t really become any more exciting when crudely drawn in felt-tip pen does it? My son who also loves Star Wars (he was 4 in 2010), watches the opening crawl with mounting boredom, irritation and finally anguished tears. “Oh, oh… here it comes!” he says, as one crawling paragraph drags to a finish. Then another begins, “Ohhhhh! No, not more!” he groans. I’ve grown accustomed to skipping it. Legend has it that George’s original intention was that his Sci-Fi film would be a homage to – or even a remake of the Flash Gordon serials he’d watched in the cinema every Saturday as a boy. The scrolling crawl would seem to be directly taken from those 1940s films. I’m pretty sure that there’s no hyphenation on the crawl in the film. But then, being professionals, I expect the crawl people actually planned out the flow of the text. 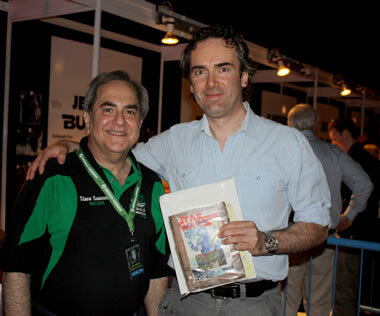 “Of course, Steve realises that by posing for this photo, he’s officially endorsing the comic.” I said. Chapter IV --- STAR WARS. 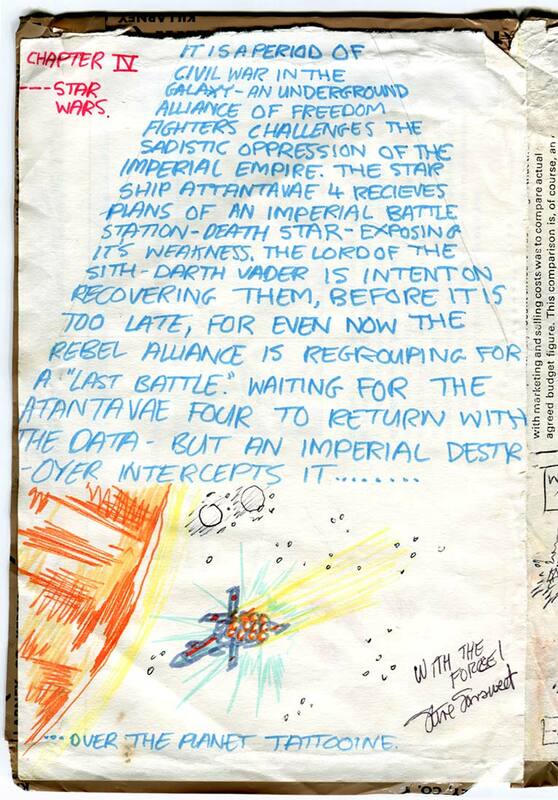 Wobbly text fills top 2/3 of the page, in emulation of the Opening 'Crawl' of Star Wars. "It is a period of civil war, etc etc." Below is my youthful interpretation of what the Tantive IV looked like. It's like a cross between the actual ship and an X-Wing! Space is white - as always - with the dull-looking twin-suns in black biro, beside a flaming Tatooine. 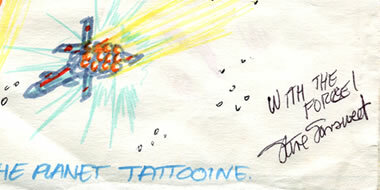 Tatooine and the Tantive are rendered in colourful felt-tip marker pens. Yes, I must teach Johnny that anticipation is the greater part of enjoyment! I like the ‘side note’ Dan. Other people’s stories are often far more interesting than they themselves will credit. Thanks again for the YouTube research. Hey, where did you get that neo-Corellian Corvette ship design from? It looks like a hybrid Corvette and Federation Pursuit Ship from Blake’s 7. I love it. What a great cross! I so want a model of this now. Search me! Your prescience astounds me. Wait until you see the SHURE 55 microphone meets Blakes 7 ship’s arse design. Nope Your Honour. Mea culpa. At first glance I thought the crawl was quoted directly from the film or novel, then I realized it was rewritten to include references to the name of the Rebel Blockade Runner, as revealed years later in the Star Wars Radio Drama. Brian Daley named the ship “Tantive IV” in his expanded audio version of the story. Looks like you had heard the RD by this time, but hadn’t seen that name in print, judging from the TWO ways it was spelled in your crawl. Ironically, I just found this site from a Facebook page devoted to the Star Wars Radio Series. Welcome to the site! Interesting – I actually never realised that the ship’s name was from the Radio Drama! So my 1981 date for this page has been given increased accuracy. I don’t know why I thought it was pronounced ‘Ah-tanti-vay’. I have to say I still like the oppression of the Imperial Empire. They’ve more respect for civil liberties over in the Republican Empire, of course, although we avoid the Tribal Empire because there’s no cell phone service over there. Indeed. I think it’s good that they’re so precise about telling us who they are.